Preheat oven to 180ºc. Bake the beetroot wedges with just a light drizzle of olive oil and about a tablespoon of freshly chopped rosemary for approx. 45 minutes or until they’re tender. While that’s cooking, gently fry the haloumi until it’s golden on both sides. Using the same pan, lightly toast a handful of walnuts. Trim the ends off the beans and cut into roughly 2 cm pieces. 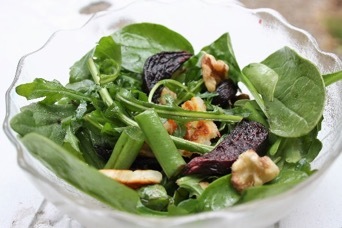 When both the beetroot and haloumi have cooled, simply place the rocket, beetroot and haloumi together in a bowl with the green beans. Sprinkle the walnuts over the top and drizzle with a little balsamic vinegar.